Some of you may or may not remember my first addiction confession. Well, it’s been a few months since my first admission, and I’m here to tell you that there is something else I’m addicted to … lip balm. I can’t really give an accurate count to the number of different balms, sticks, and waxes that I have because they are strewn, littered, and hidden in purses, pant pockets, drawers, between pillow cushions and under the bed. I have no idea how many I have, but trust me when I say it’s a LOT. Being the owner of so many different types of lip balm – off the top I can think of a few different brands, such as Burt’s Bees, Blistex, and C.O. Bigelow – I’m getting pretty good at knowing what things I do and don’t like in a lip balm. I recently received some samples of Softlips, and after using them for just a week, was reminded of why I liked them so much back in high school so many years ago. The first thing that makes Softlips different – the tube is longer and skinnier than other lip balms on the market. You wouldn’t think that it matters, but you can definitely tell when there’s a tin or a thick tube in your pocket, especially when you sit down. The Softlips tube fits unobtrusively in my pocket, next to the pant seam so you can’t tell that it’s there. Just a warning, since it’s thin, make sure you double check your pant pockets before throwing them into the washer. I have washed at least 3 different Softlips tubes. Interestingly enough, they all survived the washer and dryer process. I once washed a red, cherry flavored lip balm from another company and ended up getting red wax over my clothes. So at the very least, if you do leave a Softlips in the wash, it has a decent chance of survival. Haha! I was very excited to try out the new Limited Edition Winter Season Softlips flavors. 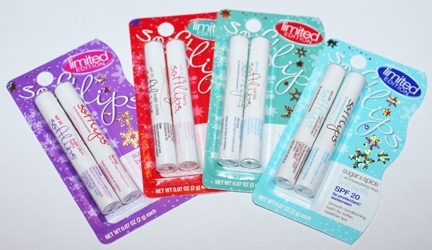 The Softlips Limited Edition winter flavors are your tradition Softlips Lip Balm. Their winter flavors include Winter Mint, Sugar cookie, Sugar & Spice, and Sugar Plum Berry. I’m a huge mint fan, so I went straight for the Softlips Winter Mint. All of the Softlips Limited Edition winter flavors have SPF 20, which is important since most people forget to put on protection for their lips when they’re going out. If your face lotion has SPF, your lip balm should have SPF as well. The lip balm glides on smoothly and clearly onto your lips. I love that it’s an evenly distributed light layer that doesn’t leave your lips feeling like they’re caked on with something. You can use Softlips under or over your traditional lipstick, but I since I don’t wear lipstick, I wear it alone. It isn’t a gloss, so your lips just have a subtle, natural look and not a high gloss to them. Softlips has also introduced a new “green” line of lip conditioners with their new USDA-Certified Organic lip conditioners. The Softlips Organic Lip Conditioners are 95% organic and 100% natural. The ingredient list on the back of the packaging lists: organic coconut oil, organic olive fruit oil, organic beeswax, organic jojoba seed oil, organic peppermint oil, organic shea butter, spearmint leaf oil, organic peppermint leaf extract, flavor, and vitamin E. (They use the more technical terms, but I didn’t feel like typing out those long words, haha!) In addition to being certified organic, the Organic Softlips Lip Conditioners are gluten free, free of pesticides and harsh chemicals, and is cruelty-free (contains no animal by-products and is not tested on animals.) 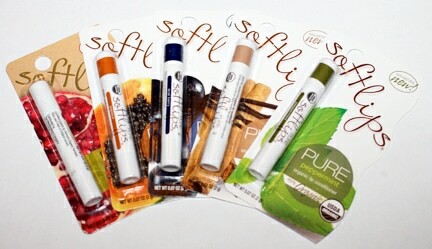 Flavors for the organic Softlips include: Pomegranate, Honeydew, Peppermint, Acai Berry, Papaya, and Chai Tea. I love that they have such a variety of interesting and exotic flavors available. And while these are organic, the still offer the same slim packaging and smooth, easy protection that the other Softlips lip balms provide. Random fact – did you realize that Softlips was made by the Mentholatum Company? 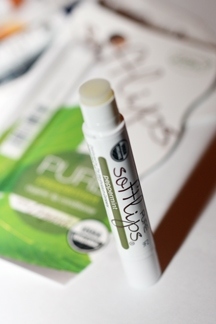 Yup – the company that makes that wonderful eucalyptus-y smelling ointment makes Softlips as well. Anyways, getting back. As I mentioned at the beginning of this post, I was a big Softlips user back in high school. As I got older, I started trying different brands – ones from more “adult” brands that were a little bit more expensive. Unfortunately, those lip balms just don’t cut the bill. There’s one brand in particular that will leave icky white gunk all of my lips at the end of the day. I literally had to wipe it off my lips at work because it was balling up and collecting in the corners of my mouth. It was very gross and not very professional at all. With Softlips, I don’t have that problem. No white gunk at all, even after a full day of meetings. Softlips is once again one of my go to lip balms. It provides smooth, light, lasting protection without being waxy, sticky or oily. If you would like to try them out, Softlips is available in mass retailers, supermarkets, and drugstores for ~$2.79 per stick , or $3.99 for value packs. For more information about Softlips, visit their website www.softlips.com. Also make sure you become a Softlips fan on Facebook where they’ll be posting news, giveaways and tips. Disclaimer: This post consists of my (and/or fellow tester) opinions only. No compensation was given for this review/giveaway. I did receive free tubes of Softlips from the manufacturer or the representing PR agency to use and test for the purposes of this review. This did not affect the outcome of this review. I really want to try the Pomegranate. The best review I have read on Softlips! 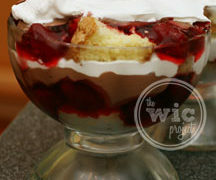 The Acai Berry sounds exceptional! Thanks for a spectacular website that shows you put in a lot of love!